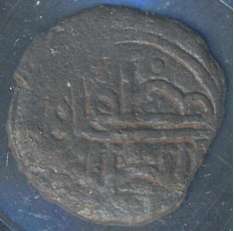 In Arabic "Muzaffar Shah Al-Sultan"
Interlaced Arabic inscription "Nasser Al-Dunya Wa ad-Din"
Sultan Muzaffar Shah was the fifth Sultan of Malacca. He ruled from 1445 to 1459. He is the son of Sultan Muhammad Shah. The original name of Sultan Muzaffar Shah is Raja Kassim and known as Sulutan Wudafona Sha in History of Ming of China. Raja Kassim, son of Sultan Muhammad Shah and Tun Wati, was installed as the fifth ruler of Malacca after the death of Sultan Muhammad Shah. After his installation as ruler of Malacca, Raja Kassim titled as Sultan Muzaffar Shah. Sultan Muzaffar Shah has ordered senior officers to perform all the customs, traditions and prohibitions introduced by his late father. Sultan Muzaffar Shah married with the daughter of the Bendahara (Prime Minister) and had a son named Raja Abdullah. 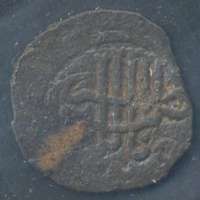 The Malacca Sultanate (Malay: Kesultanan Melayu Melaka; Jawi script: كسلطانن ملايو ملاك) was a Malay sultanate centered in the modern day state of Malacca, Malaysia. Conventional historical thesis marks circa 1400 as the founding year of the sultanate by a renegade Malay Raja of Singapura, Iskandar Shah, who was also known in certain accounts as "Parameswara". At the height of the sultanate's power in the 15th century, its capital grew into one of the most important entrepots of its time, with territory covering much of the Malay Peninsula, Riau Islands and a significant portion of the east coast of Sumatra. In 1511, the capital of Malacca fell to the Portuguese Empire, forcing the last Sultan, Mahmud Shah (r. 1488-1511), to retreat to the further reaches of his empire, where his progeny established new ruling dynasties, Johor and Perak. The legacy of the sultanate remained, with significance lies in its far-reaching political and cultural legacy, which, arguably, continues to be felt in modern times. For centuries, Malacca has been held up as an exemplar of Malay-Muslim civilization. It established systems of trade, diplomacy, and governance that persisted well into the 19th century, and introduced concepts such as daulat- a distinctly Malay notion of sovereignty - that continues to shape contemporary understanding of Malay kingship.